Published by Cyril Huze April 19th, 2018	in Accessories, Controls, Customs and Legal. Klock Werks Cycles that develops motorcycle parts is accusing a rival in California of infringing on a patent for its most popular product. Klock Werks Kustom Cycles and owner Brian Klock say Dragonfly Cycle Concepts of Fullerton, Calif., is selling a knock-off version of the company’s award winning Flare Windshield. The product, released in 2007, stabilizes motorcycles by keeping them from lifting at higher speeds. A patent for the windshield was issued on Feb. 10, 2009, according to the lawsuit. That was followed with additional patents, including five international patents. 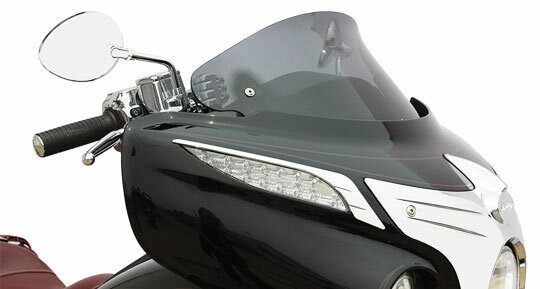 The lawsuit alleges that Dragonfly sells a windshield, called the Batwing, that infringes on the Flare patent. The lawsuit says the Batwings were being sold at the Sturgis Rally last year. Photographs and schematics of the Flare and Batwing included in the lawsuit show the two are indistinguishable. The lawsuit is seeking three-times the amassed damages, as well as interest and attorney fees. I am betting Mr. Klock wins that one and rightfully so. Stolen technology is a serious crime and I’m glad Mr. Klock went to the considerable time, trouble and expense of patenting his designs. I imagine he is as well. A big no-no. that also looks like Arlen Ness Flip? OZZIE21 You might care, if you spent years of hard work and money to design a product that feeds your family and then have a competitor copy the design and rip you off. I am glad to see Brian spend the time and money to go after them. I support your move 110%. If Dragonfly can show that their design is at least 18% different than KWC, there won’t be a case of infringement. They look awfully close though. It’s really hard to be “creative” with those products, without stepping on another company’s toes. The hardest part will be to determine sales damages as well as brand confusion. Little rider, lawyers will find another reason to keep pursuing the Fees that keep the Bottom Feeders eating……I would say that if your Attorney take your Case on Contingency than it is worth it 100%..Normally thats the best way to find a Lawyer who believes in you, your case!